I'm a dummy and forgot that drawing a rect and drawing an image are two different things and will need two different pipelines with their own shaders. Unless there's any objections I'll leave this here in case anyone finds the contents useful. I'm currently setting a custom pipeline for a Graphics2 instance (on HTML5) so that I can mask a filled rectangle (to draw some health bars with rounded corners without resorting to 9-slice images). When I do this, the mask works perfectly. Also, any images I draw are masked and drawn in proper colour. However, whenever I try to fill a rect with a given colour (g.color = Color.red; g.fillRect(/*...*/);), it is drawn in pure black—i.e. that implies that the vertexColor attribute in the vertex shader either isn't being set or is being set to black. I've dug through the Graphics2 implementation and figure out why this would be happening. The same behaviour is seen if I completely rip out any of the masking and just straight copy the shaders and set the pipeline as above. And all failed to compile (metal on XCode, vulkan and direct3d12 on visual studio 2017). Exception thrown at 0x000000005337A203 (nvoglv64.dll) in g5.exe: 0xC0000005: Access violation reading location 0x000001D0DA6C48C0. It seems like the vulkan and metal errors fall into the "Metal and Vulkan need some updates", but do the direct3d12 errors fall under the "wiring it up in kha"? Is there any way I can help sort it out? What's the state of the graphics5 api today? Is it fully functional across all platforms? Hey, I just finished a game I made with kha for the xoxo game jam (you can check it out here: https://blazingmammothgames.itch.io/bun-snap). There were a few pain points but overall I think using Kha in an actual project went quite well! I'm trying to get some g4 stuff working on iOS, however all the textures are black. When I loaded png textures in a g2 context in a previous demo, the textures loaded fine; but now in g4 they're all black. I've tested with my sample (https://github.com/FuzzyWuzzie/gltf-sample-kha) as well as Lubos Lenco's examples. @FuzzyWuzzie turns out I just had a massive brain fart earlier. I should have been using the Less compare function, and clearing the depth buffer to 1 (I was using GreaterEqual and clearing to 0). Sorry to bother you! I'm trying to test my glTF library (https://github.com/FuzzyWuzzie/haxe-gltf) for loading glTF models. Basically, right now, I just want to load the mesh data and display it. And what I have right now kind-of works: https://fuzzywuzzie.github.io/gltf-sample-kha/ (source code is at: https://github.com/FuzzyWuzzie/gltf-sample-kha). 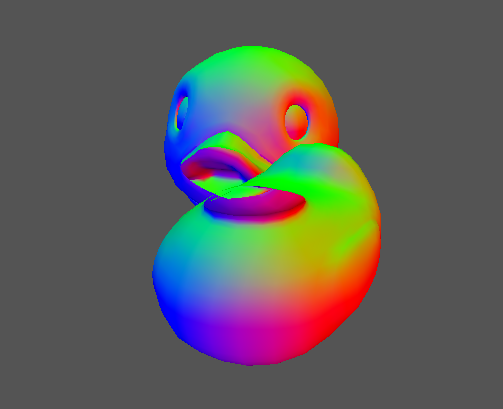 As far as I can tell, the glTF data is being loaded correctly (I've manually checked things on smaller triangle and quad models), but it clearly isn't rendering correctly; and it seems like a depth issue (the colours are coming from the mesh normal). But it seems like perhaps the depth buffer isn't being used? Or is there something else wrong with the model data? I could really use another pair of eyes on this if you're available. @Robert Not that I'm aware of; I didn't stick around with KodeStudio long enough to find anything when I realized I couldn't use extensions. I prefer to do all my development in Visual Studio Code these days. I know KodeStudio is a fork of Code, but it disables a bunch of things I'd rather it not. Thankfully, I just discovered how to easily debug my projects within Visual Studio Code (I used to just debug in the browser), and figured I'd share in case anyone here is in the same boat. Click the debug tab, select the 'Kha/HTML5' configuration, and launch! You can set breakpoints, inspect variables, etc.